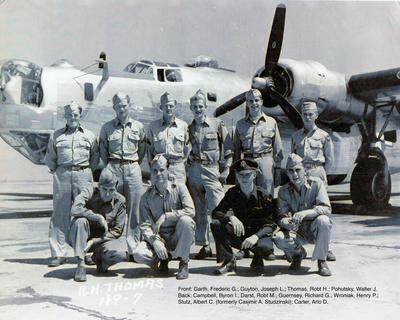 As the son of Al Stutz, I am really happy to have located a photograph of the Robert H. Thomas Crew, 512th Squadron, 376th Heavy Bombardment Group. The photo is attached and includes the names of crew members and also shows the name of the Army Photographer. Your website is excellent, but can no longer state that there are no known photos of this Crew. The photo is believed to have been taken in 1944 in Foggia, Italy, but I haven't been able to confirm that. My father was based in Libya and then Italy. My father changed his name from Casimir A. Studzinski to Albert C. Stutz not long after World War II. He flew on the second round of bombing missions over Ploesti and a number of other missions, fifty in total. Our Family considers my Dad and all of you as great heroes. Thank you for your service. I never got off the ground in the U.S. Army from 1969-1971. Curiously enough, one of my Dad's last jobs before he retired was with a West Berlin paper company. On his first visit to Berlin the company president asked him if he had flown to Germany before. On reflection he decided not to say that yes, he had been to Germany, but he didn't land. My Father died in 1992, survived by his wife Marian Joan Smith and five sons. There are plenty of descendants. Best wishes for the continued success of your Website and your Association. I would be happy to hear from any members of the Thomas Crew at rgstutz@usa.com .